Decorative element par excellence to finalize an atmosphere in a room, the curtains need to be washed regularly to keep their outfit, bringing, of course, a particular care according to their material. It is important not to wait for a critical point before washing your curtains. The recommended average frequency for curtain maintenance is once a month. 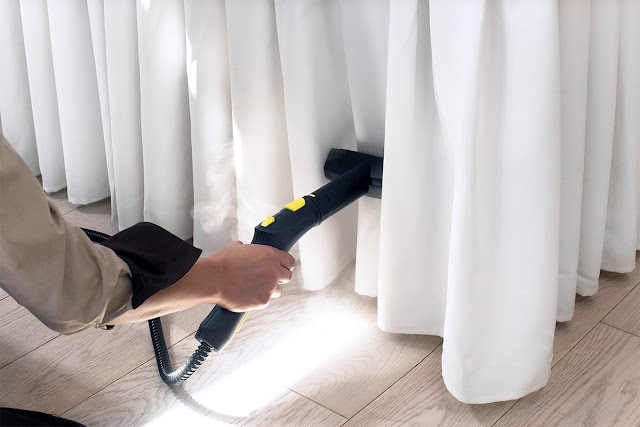 This maintenance of the curtains takes into account: the elimination of the dust and the cleaning of the tasks. A fortiori, if you live in a fairly polluted area or your curtains get dirty quickly (thank you toddlers), you must check their condition every 15 days and act on the moment. You can use a classic vacuum with a suitable tip. The latter will pass much more effectively between the curtains and your curtains for example. There are two options for cleaning the curtains: either you do it yourself or you entrust it to a professional. Indeed, some fabrics do not wash by hand or machine! To make them clean, you will absolutely have to turn to the dry cleaners or dry cleaners. For materials that can be washed with water, you can take care of it or call a cleaning expert in the Household section by following the different techniques of dyers to apply depending on the type of curtain you have. Before you start washing your curtains, it is important that you take into account the material that composes them. Indeed, take the time to read the label of your curtains to know how to wash them. If they do not have a label, here are some tips for washing different types of curtains. For batik curtains, it is strongly recommended to wash them by hand so as not to alter their color. Wash them one by one in warm water with Marseille soap. Curtains in hemp and linen are machine washable. To do this, do not exceed a temperature of 50 ° C for washing. Also, avoid detergents and chlorine-containing products as they tend to damage flax fibers and yellow them. In addition, it is recommended not to wring too many curtains. It is best to iron when still slightly wet. Chintz curtains should be treated with care so that they do not lose their frosting. Thus, it is recommended not to machine wash them or soak them completely. To clean chintz curtains, the first step is to dislodge dust with a vacuum cleaner. Then spread your curtain flat and with a clean cloth soaked in warm soapy water, dab the stained areas of your curtain. Finally, let it air dry. Cotton curtains can be washed by hand or machine, preferably with Marseille soap. The washing of a cotton curtain must not be done at a temperature above 60 ° C. To avoid seeing your laundry turn yellow, pour a few drops of white vinegar into the last wash water. To learn more, read the article Linen: our tips for a bright white. If your curtains are colored or have patterns, you can first check the color of the print with a cotton towel and your iron. To do this, put your dampened cloth in a colored location of your curtain then go back over it. If it fades, then the colors are not stable and it would be better if you give your curtain to the laundry. However, if the colors are well fixed and do not fade on your cloth, then you can wash your curtains using always preferably Marseille soap. Powdered laundry containing whiteners could wash out the colors of your curtains. To iron colored curtains, always do it on the wrong side. If you have velvet curtains, the priority will be dusting them off. Then check on the label if they can be washed with water. If so, wash them by hand with warm water and Marseille soap. If not, entrust them to your dyer. Entrust the maintenance of your curtains to the pros of the linen and the household. Check the profiles in the Household section and trust the opinions left by clients on their cards. You can also customize your request by clicking on "Request a service".